Mid dermal burns have a zone of damaged non-viable tissue extending into the dermis, with damaged but viable dermal tissue at the base (4). Preservation of the damaged but viable tissue (particularly in the initial period following injury) is pivotal in preventing burn wound progression. As some of the nerve endings remain viable, pain is present but is less severe than pain of superficial burns. Similarly as some of the capillaries remain viable, capillary return is present, albeit delayed. Blisters maybe present and the underlying dermis is a variable colour (pale to dark pink). It is not possible to predict healing times of these burns early after injury, and usually, a conservative expectant approach is indicated for at least 2 – 3 days, when signs of healing or of burn progression are established. 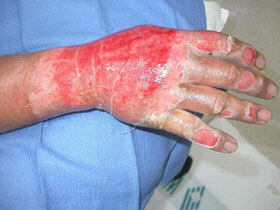 These burns require regular review in order to determine appropriate treatment. Silver based dressings are indicated in mid dermal and deeper burns.